WebRTC is part of the new HTML5 standard, a new platform for web-based communication. Using realtime communication WebRTC delivers two-way sound and video to the browser, without any plugins. In addition there are functions like screen-sharing, chat and encrypted secure data channels between browsers. As the protocols and implementations are getting stable and well specified applications are beginning to show. Most major web browsers already support WebRTC and others are to follow. In addition, there are many gateways and servers that support WebRTC. During this conference you will learn the basics of WebRTC and get to showcase a few different applications. Experienced application developers and contributors to the W3C and IETF standardisation will share their knowledge. Speakers – get in touch now! We are currently looking for speakers. If you have an idea of something you want to talk about, let’s get in touch now. Send e-mail to oej (at) edvina.net or find me on social media – @oej on Twitter is a good starting place. Visitors – register in our Meetup! Join the WebRTC Stockholm Meetup and register for the meetup! There is also a Facebook group called “WebRTC Forum” where you have everyone connected to WebRTC to chat with. Sponsors – meet with the most brilliant web developers in town! At this point we have a few slots open for sponsors who want to participate during the conference in some way. Speaking slots are not for sale, but there are plenty of other opportunities to participate. You will be able to put up a standing banner in the conference room, hand out cool give-aways and get in contact with the web elite and network gurus that will be participating. We also have opportunities to sponsor lunch and coffee breaks. Contact Olle Johansson (oej (at) edvina.net ) for more information about our sponsorship packages and get one while we have them available! The first sponsorship slot is already assigned to Connectel in Uppsala that pays for the conference center costs. In addition Ingate Systems and Avanzada 7 are sponsors. The conference will be held in the Venue 81 in Downtown Stockholm. It’s very close to the Stockholm city center. The project manager for WebRTC Stockholm is (if you haven’t already figured it out above) Olle E. Johansson, the founder of Edvina. Olle has spent many years with realtime communication protocols, including the SIP protocol for voice over IP. He has worked in the Asterisk Open Source project to create a telephony media server as well as the Kamailio Open Source SIP server project. Olle is also active in the IETF with standardisation, has contributed to multiple SIP Forum recommendations and is proud to be the author of one RFC (hopefully with more to come). 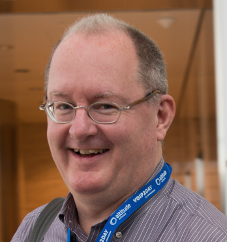 Olle is a popular teacher in many areas, from TLS and PKI to SIP, WebRTC and realtime multimedia. As a speaker, he is engaged, positive and succesful with many audiences. Edvina was founded in 1987 with the motto: "Internet Technology for Business Use"